If Tsubaki Grand Shrine is like a big parish church with a lot of staff and many members, Ise Grand Shrine is like Vatican City. Years ago, I visited Rome and saw the papal city, and it’s the only thing that compares to Ise in my mind in terms of the sheer number of people. At Ise, where I visited today, there were more than 10,000 people there to visit the shrine. There’s a small town just of shops and restaurants for the visitors. It’s incredible. The shrine has a staff to match, with about 100 priests and several hundred other workers, too. Tsubaki has about 25 priests, with about that many other staff members, too. One of the many buildings at Ise Grand Shrine. Other things about Ise are incredible, too. Every 20 years, they completely rebuild all the shrine buildings and bridges from scratch. They haul in lumber (by hand for the important pieces), shape it all by hand in the traditional techniques, and build every shrine building again. All the different shrine buildings have two sites: the one where the shrine is sitting right now, and an empty spot (except for a small symbolic shrine) where the shrine will be rebuilt for the next cycle. The cost to do this? The last time they did it a few years ago, it was more than $500 million, some from the shrine funds, and some from private donors. It’s amazing, and something more than a few people have questioned. Couldn’t that money be better spent other ways? Perhaps. Ise is the most prestigious and important shrine, so nobody is going to tell them what to do. They’ll do things the way they think they should. The Tsubaki priest, Rev. Ochiai, who accompanied me and I walked around the entire shrine (which has two locations about a mile apart), and saw most of the buildings. The buildings themselves are not that different from Tsubaki, though perhaps a little more traditional in their construction. But it really is the people that make the difference. Tsubaki has hundreds of visitors most days, and on some occasions, like New Year’s Day, may have as many as 100,000 or more. Ise has thousands almost every day, and has hundreds of thousands on big occasions. 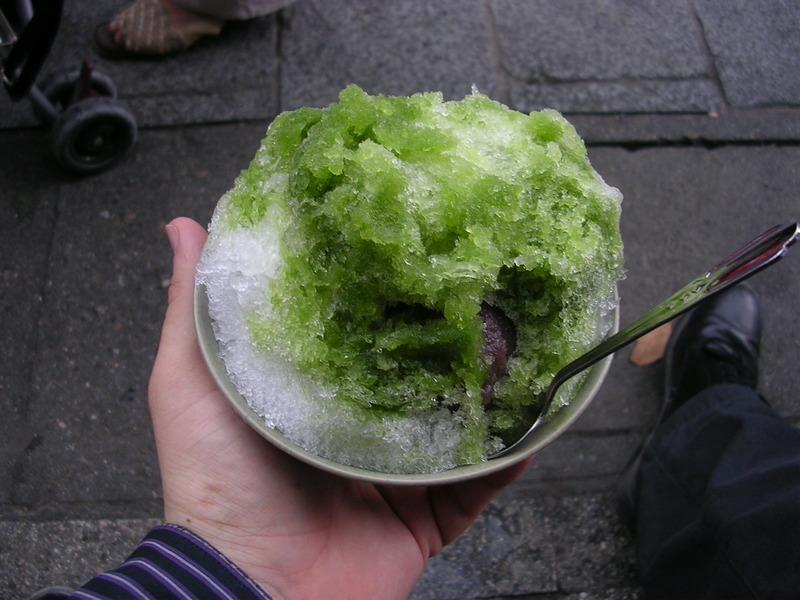 This is a special treat: green tea ice over sweet bean paste and rice balls. The shops are fascinating, too. There are many restaurants, including one that specializes in beef where we ate lunch. They really knew how to do medium rare, by the way. We had dessert at a shop that is more than 300 years old. The specialty is sweet bean paste and rice balls, which have a gummy texture. We had ours the new way, which is to serve the paste and balls covered with a green tea snowcone, basically. It was strange, but sweet and quite good. Rev. Ochiai asked if we could sell it in New York. I think it might have a chance. There were gift shops and jewelry shops (the most expensive piece I saw was a necklace with a single huge pearl offered for 30 million yen, which is several hundred thousand dollars). The smell coming from a fish shop was so powerful I couldn’t walk away fast enough. And many shops sold street food – both traditional Japanese fare and ice cream cones. All in all, it was a little overwhelming. I like Tsubaki very much. 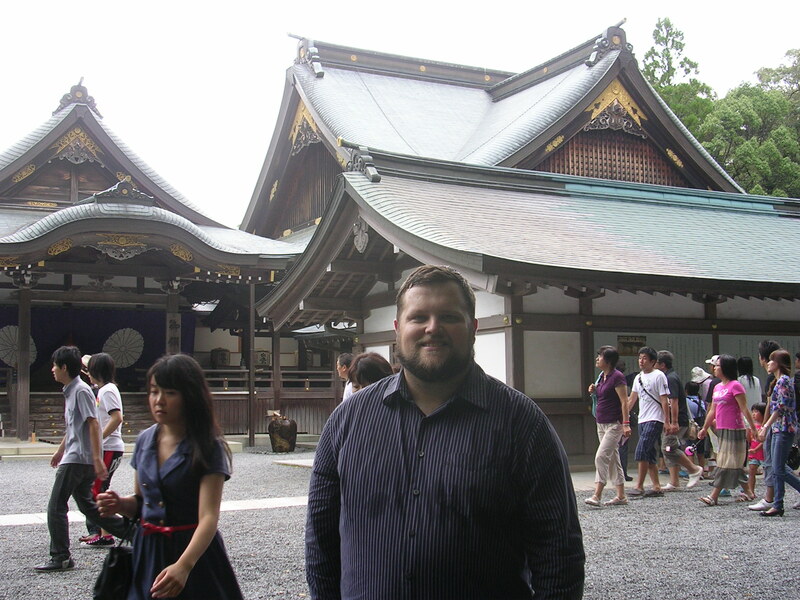 Ise is a very different thing, though both are historic Shinto shrines. The sheer numbers of people at Ise will be my lasting memory.